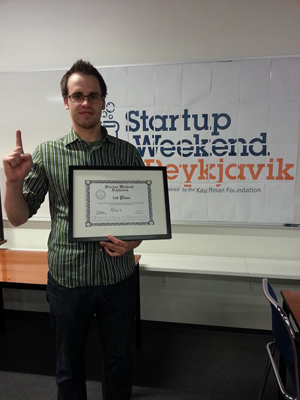 Startup Weekend took place for the fourth time in Reykjavík. IIIM visiting researcher Benjamin Blumer participated in this event and we are happy to announce that his team was awarded the 1st place prize for its project “Nuus’s news”: an app for iOS that gathers news and information in one place. Similar to Spotify, but for news. “Startup Weekends are weekend-long, hands-on experiences where entrepreneurs and aspiring entrepreneurs can find out if startup ideas are viable. On average, half of Startup Weekend’s attendees have technical or design backgrounds, the other half have business backgrounds. Beginning with open mic pitches on Friday, attendees bring their best ideas and inspire others to join their team. Over Saturday and Sunday teams focus on customer development, validating their ideas, practicing LEAN Startup Methodologies and building a minimal viable product. On Sunday evening teams demo their prototypes and receive valuable feedback from a panel of experts.”. Startup Weekend Reykjavik is a Klak Innovit and Landsbanki collaboration project. It took place on 18th – 20th October, 2013 at University of Reykjavík with the participation of 70 individuals. 13 teams were formed with a goal of implementing their ideas as far as possible over a single weekend. IIIM visiting researcher Benjamin Blumer participated in this event and we are happy to announce that his team won the 1st place prize. Nuus ‘s news is an app for iPad and smartphones that gathers news and information in one place. Nuus is a kind of Spotify for the news. Odd sized feet goal is to open an online business where people with different sized feet can buy shoes in their sizes. Green Innovation goal is to provide a platform for individuals, businesses and educational institutions as a strategy for new and environmentally friendly practices . Archimedes goal is to develop a video game based on verified methods to teach mathematics and allow teachers and parents to monitor the progress of students with easy manner.